The right technology helps physical therapists report and document patient care accurately and efficiently. Earlier this year, legislators passed HR 4302, “Protecting Access to Medicare Act of 2014,” which once again temporarily addressed the flawed Sustainable Growth Rate (SGR) formula for Medicare Physician Fee Schedule. This latest legislation brings the physical therapy industry closer to a new payment model that will offer significantly more value to patients while mitigating Medicare and insurance fraud and abuse. Historically, the physical therapy industry has operated on a fee-for-service billing model. 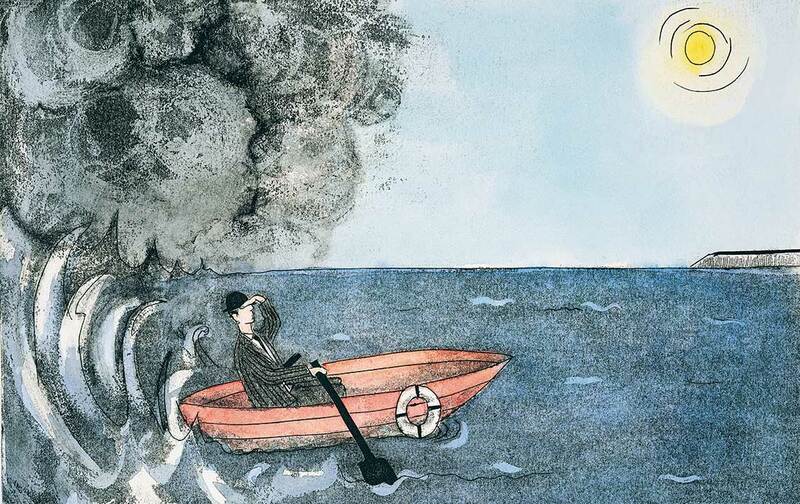 Because the process is subjective, there has been room for interpretation. Ongoing treatment and procedure codes are based on time, and do not consider patient improvement or how time is spent with the patient. As a result, overbilling and inaccurate coding—either intentional or accidental—are common in the physical therapy industry. To remedy the flawed program in 2007, Medicare introduced the Physician Quality Reporting System (PQRS) to gather quantitative data on the quality of the care being provided to patients. PQRS uses a combination of incentive payments and payment adjustments to promote reporting of quality information by eligible professionals. While well intended, this voluntary program has low participation, particularly in the area of outpatient rehabilitation. Despite the bonus potential and/or penalties tied to reporting, the majority of physical therapists opt out of this program because of its onerous reporting requirements. In 2013, Functional Limitation Reporting (FLR) was introduced, shifting the emphasis from providers to patients and patient outcomes. Similar to PQRS, FLR is a quality-reporting initiative that gathers data on patient status and outcome. While PQRS is focused on risk, the emphasis of FLR is on function (i.e., how a patient’s functional limitations have changed as a result of the therapy that they received). Unlike PQRS, FLR is mandatory; therefore, if a physical therapist does not report, he or she will not be paid. While elements of PQRS will remain, it is apparent that the claims-based reporting option is going away and will not be an option in 2015. 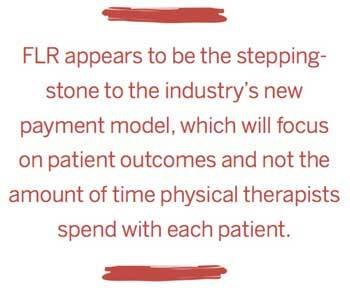 However, FLR appears to be the stepping-stone to the industry’s new payment model, which will focus on patient outcomes and not the amount of time physical therapists spend with each patient. In 2016, a new payment model is expected to be introduced, which will have new evaluation codes and a more simplified coding system. Coding will follow a patient’s current medical status, how severe or involved the patient is, and the amount and intensity of treatment that is required to move a patient from their current level of function to their optimal level of function. It is anticipated that the evaluation component of this new model will mirror the physician model that utilizes evaluation management (EM) coding. Using this model, physicians bill different value codes for an evaluation based on the complexity of the patient condition and evaluation procedures required. For example, if the physical therapist performs a battery of tests and the treatment is very involved, coding is billed at a much higher-level evaluation code. 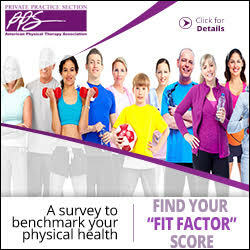 However if the patient’s condition and assessment were straightforward, requiring only limited assessment tests that are problem focused, physical therapists would bill at a lower evaluation code. The EM coding model has been around and worked in the physician world for some time. While most people realize that the current physical therapy payment model must change, providers fear that they may be paid less. While providers certainly will not be paid more under this new model for giving good care, being efficient, and obtaining good outcomes for their patients, they should not be negatively impacted by the change. In contrast, however, for those blatantly abusing the system, the new payment model will make fraud related to overbilling difficult. Providers will need to show how involved they were with the treatment, patient status from start to discharge, and demonstrate the value of care that they are providing patients—otherwise they will not be paid. Providers may have trepidation about the new payment model, particularly if they are taking liberties when billing. For these providers the impact of these billing standards will be significant, and lead to a 15 to 20 percent decrease in revenues. Having the right tools in place will help physical therapists accurately report. Gathering data is essential to the success of this new payment model. For the outpatient rehabilitation market, providers need a standardized outcome tool to benchmark against. Such a tool most likely will be a combination of something the patient completes, an overall sense of improvement/satisfaction with the care they were provided, and something more quantifiable on the provider’s side, such as where the patient started, how they improved, how many visits the improvement required, and the cost involved. From a technology perspective, capturing the appropriate documentation and data elements will be essential to a provider’s success. Documentation technology will play a pivotal role in a provider’s ability to record and report the functional status of a patient at the outset of care, throughout the care model, and at the end of care. 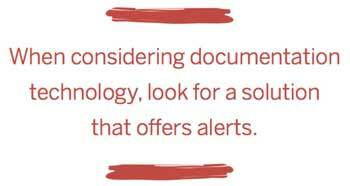 When considering documentation technology, look for a solution that offers alerts. Providers are required to report at specific intervals—at the onset of care and then every 10 visits—or they will not be paid. In addition to alerting the physical therapist to report on FLR, the documentation system should also alert the scheduler at the front desk to the impending deadline so that they can put an additional reminder on the physical therapist’s schedule. Visual alerts and dashboard make reporting on a timely basis easier for physical therapists. The ideal system should also assist providers with documentation. Similar to a clinical decision-support system, it should guide clinicians to the appropriate coding and billing selections. For example, built-in logic can guide providers along the way, ensuring test measures have been completed and offer code recommendations based on the type of visit and other pre-determined justifications. The system should provide clinicians with the power and guidance to bill appropriately given the amount of time spent treating patients and the intensity of the service provided in combination with current medical condition and functional status of the patient already documented within the system. The use of algorithms and logic will make documentation easier for clinicians, thus enabling them to spend more time on treating patients and less on reporting. As the industry continues to move toward a new payment model, clinicians will likely see an expansion of the current FLR requirements. The ability to report accurately ensures claims are processed and paid efficiently. Documentation technology with built-in logic will keep you on top of these changes. David McMullan, PT, is vice president of Product Management for SourceMedical. David has more than 20 years of outpatient rehabilitation health care experience. He can be reached at David.McMullan@sourcemed.net.